Want your shoppers be able to upload files and images, just purchase our VM Order Upload Images Plug-in for the best price and support. 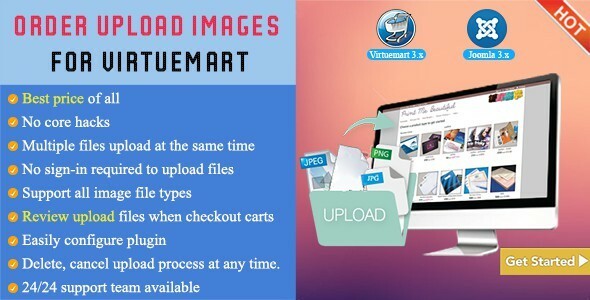 Upload Images and Files with your order in Virtuemart – VMUpload is a versatile plugin to the core application Virtuemart that allows for a customer to upload files to their order based on parameters established by the site administrator. VM Order Upload Images allow customers to upload their images, photos on shopping sites. These could be customer’s additional wishes to the current items. Website admins also find it easy to manage uploaded files in control panel. Furthermore, Virtuemart Order Upload plugin doesn’t break core virtuemart hacks. The extension is ideal for any websites with friendly and easy to customize Backend options, . It also fits in most popular web browsers. Delete, cancel upload process at any time. - Add to compare button changes its color when item’s added.